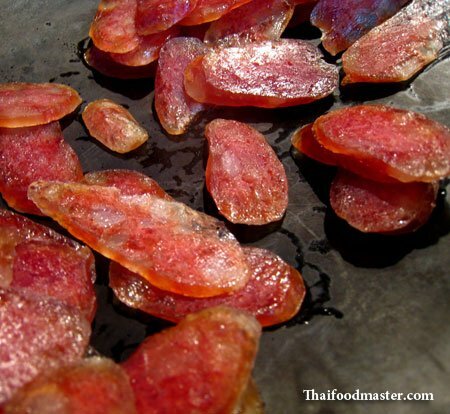 Goon chiang is a type of Chinese sausage that is is available at Chinese communities worldwide. It is usually made with pork meat and hard pork fat and seasoned with sugar, salt, pepper, garlic and Chinese spices, together with some Chinese liquor for extra flavor. This salad is quick and easy to make. The dish enjoys carnival of colors and defined flavors that stand in line to tease your palate; Sour, Salty, Hot and a feathery touch of Sweet. They are all ready to play in this less than 10 minutes preparations. The dressing is made with equal parts of lime juice and fish sauce, pinch of sugar and chilies as much as you dare. Mix just before serving. It goes well with a plate of hot white rice and crispy Thai omelette. 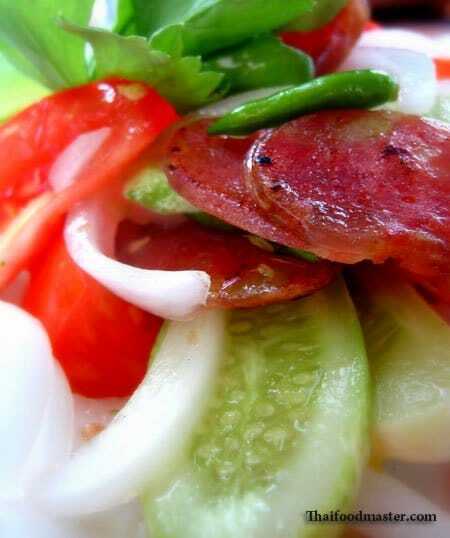 Thinly slice cucumbers and onions. Cut the tomato into eight wedges. In a wok, on low heat, roast the sausage slices until transparent and slightly charred, mix constantly to prevent burning. 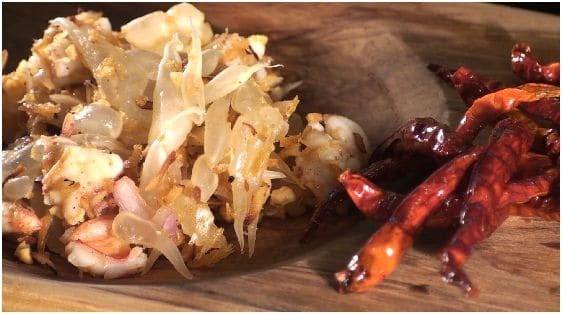 Prepare the dressing by crushing the chilies in a pestle and mortar and mixing with lime juice, fish sauce and sugar. 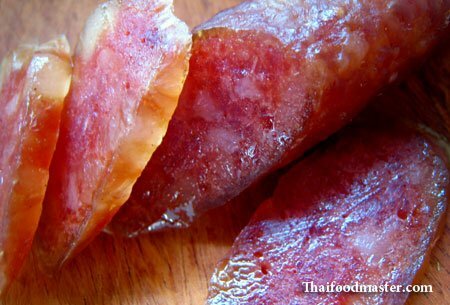 Naem is a fermented sausage made with pork, pork skins, cooked sticky rice (glutinous), fresh garlic, salt, sugar and bird’s eye chilies. 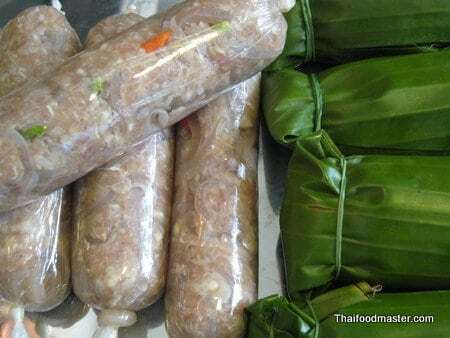 The sausage is wrapped in banana leaves or synthetic casings, and fermented for 3-5 days at about 30 degrees (C) and 50% humidity. The fermentation process enables the growth of lactic acid bacteria and yeasts, mostly lactobacilli, which accounts for the sourness of the sausage. The salt acts as an inhibitor – preventing the meat from going rotten, allowing the lactic acid bacteria and yeasts to feed on the rice and sugar, and fermenting the meat to perfection. Bitter gourds have long been prized in Asia for a trait considered a defect in cucumbers: bitterness. We tend to believe that anything bitter is medicinal and, in this case, we could be correct. The bitter gourd is said to cure a wide range of ailments – from gastrointestinal conditions to cancers, and from diabetes to HIV. Also known as bitter melons, bitter gourds are pale green, with an irregular, warty surface. Typically, they are eaten following an initial treatment to remove some of the bitterness; often they are stuffed, to complement their somewhat eccentric bite. Most Thai curry dishes call for freshly prepared curry paste that is best used fresh just before cooking. 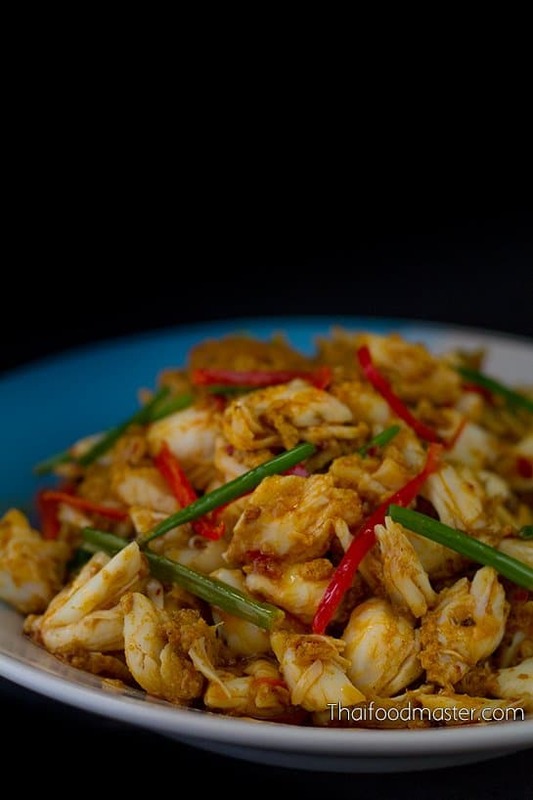 Here is a delicious and simple exception – Stir-fried crab meat in curry powder, milk and eggs – A popular Thai seafood recipe which is unique in its use of commercially available curry powder. 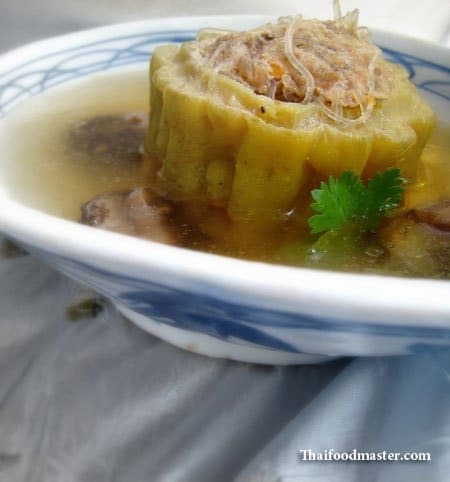 The dish was first created by Teochew Chinese chefs in the numerous Chinese restaurants in Bangkok who used to cater to the working class of Thai-Chinese immigrates, that came to the Kingdom from the Guangdong province in the southern coast of China. Thanks Den, I will try to get better and better as the project progresses ! All wonderful, except I don’t do hot. So where I like the recipe, I will substitute garlic or ginger. When I make a dipping sauce, I crush garlic, lime, fish sauce and a bit of sugar, yummy. May try the grilled catfish. 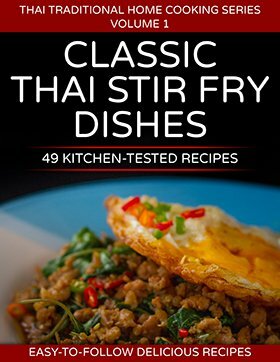 Thank you for all these wonderful recipes.